The coffeehouse giant’s vegan options are no longer limited to just guacamole on a bagel. Coffeehouse giant Starbucks launched a new vegan food option at select United States locations this week. The new grab-and-go option, Vegan Lentils & Vegetables Protein Bowl with Brown Rice, comes with butternut squash, roasted tomatoes, and sunflower seeds, and is served with a side of lemon-tahini dressing. Availability is currently limited to select locations in San Francisco, San Diego, Los Angeles, New York City, and Washington, DC. 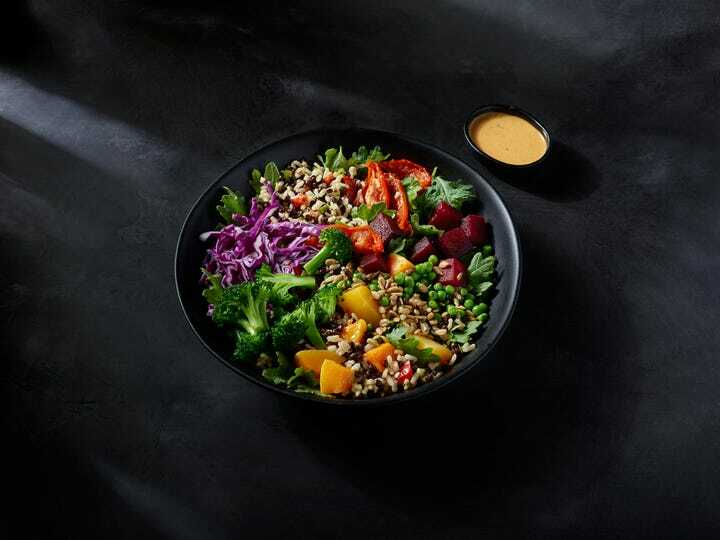 “This new bowl is also an excellent source of protein, and has more than one cup of fruits and vegetables, and is certified vegan,” a spokesperson for Starbucks stated in a press release. In March, the international coffeehouse introduced a less exciting vegan option—an organic avocado spread that can be ordered with a vegan bagel to make DIY avocado toast. Shortly thereafter, Starbucks began testing more hearty vegan options (such as Cauliflower Tabouli Salad) through its “Mercato” concept at 100 Chicago locations. On the drinks front, the company introduced almond milk to all of its menus last year, and has since been experimenting with using plant-based milks to create signature drinks—some of which are vegan-friendly, including a four-drink line created to benefit Lady Gaga’s anti-bullying organization, the Born This Way Foundation.